From "the finest literary stylist of the American right," a surprising and spirited account of how true conservatives have always been antiwar and anti-empire (Allan Carlson, author of "The American Way") Conservatives love war, empire, and the military-industrial complex. They abhor peace, the sole and rightful property of liberals. Right? Wrong. As Bill Kauffman makes clear, true conservatives have always resisted the imperial and military impulse: it drains the treasury, curtails domestic liberties, breaks down families, and vulgarizes culture. From the Federalists who opposed the War of 1812, to the striving of Robert Taft (known as "Mr. Republican") to keep the United States out of Korea, to the latter-day libertarian critics of the Iraq war, there has historically been nothing freakish, cowardly, or even unusual about antiwar activists on the political right. And while these critics of U.S. military crusades have been vilified by the party of George W. Bush, their conservative vision of a peaceful, decentralized, and noninterventionist America gives us a glimpse of the country we could have had--and might yet attain. 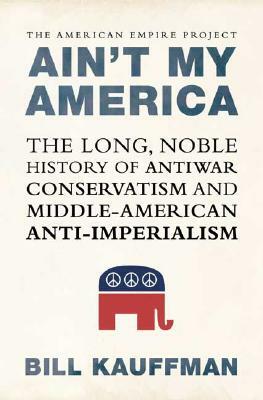 Passionate and witty, "Ain't My America "is an eye-opening exploration of the forgotten history of right-wing peace movements--and a clarion manifesto for antiwar conservatives of today. Bill Kauffman is the author of six books, most recently "Look Homeward America "(named one of the best books of 2006 by the American Library Association) and "America First." ("Dispatches from the Muckdog Gazette," 2004, is available from Picador in paperback.) Kauffman has written for "The Wall Street Journal," the "Los Angeles Times," and "The American Conservative," among other publications. He lives in upstate New York with his family.